Hi everyone, I am Alex Medford one of the new graduate assistants at the Gore Center and this is my first blog post! I wanted to share with you the exciting day I had yesterday interacting with archivists all over the United States. 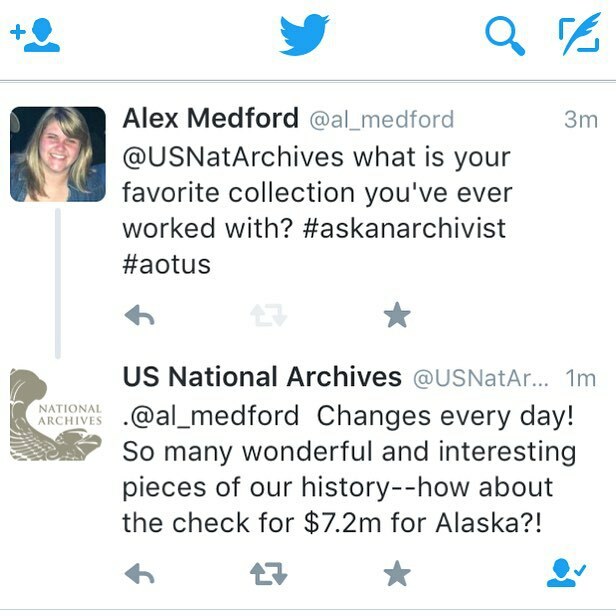 October 1st 2015, was Ask An Archivist Day on Twitter which started National Archives Month with a bang. Using the hashtag #AskAnArchivist anyone could ask questions about collections, procedures or general thoughts about archives while institutions and professionals answered! It was really amazing to see all the different organizations signing onto twitter and making themselves available, including the US National Archives, The JFK Library, Chicago University Archives and many more. 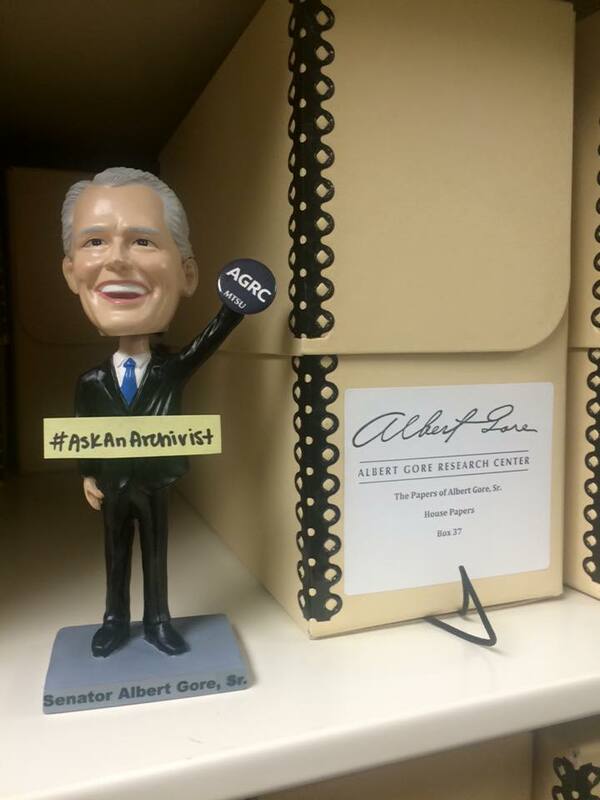 We at the Gore Center even made our own archivists available for questions with the help of our Albert Gore Sr. bobble head! As I started to watch the questions pour in from all over the country, I was struck with how cool this was. Archivist professionals and those just interested in the process were interacting in a very public way that ended up “trending” in certain places, meaning even regular people were seeing the posts. Raising the awareness for what an archive is and what archivists do was the perfect beginning for Archives month since everyone needs to know about the amazing collections and stories archives have behind their doors. After seeing many people get the answers to even the most interesting of questions, I decided to enter the fray on my own twitter account. As a graduate student in MTSU’s public history program, my first question dealt with the difference between a Master of Library Science and a Public History degree in the archival profession. I was ecstatic that the Society of American Archivists actually retweeted my tweet, I had “made it” in the social media scene!! Though many advised that an MLS degree is desired more in the job market, others expressed the importance of having a historical background in the profession. Since I just stared the program from the Public History side, seeing the enthusiasm and hope from professionals was really exciting and helpful. My favorite moment of the day came a little later. Around 1 o’clock, the US National Archives announced that the Archivist of the United States was taking over their account. I was excited to see David Ferriero interact with the multitude of interested people because you can’t get much bigger than him! Making himself available for questions, big and small, was such an awesome way to get people involved with our nations history. As I plucked up the courage to tweet him directly, I decided to ask what his favorite collection was because I knew there had to be some pretty awesome documents he had worked with. I didn’t have to wait too long for my nerdy archivist dream to come true with an actual response from him! Though it changes everyday, one of his favorite records is the 7.2 Million dollar check for Alaska. I was freaking out as I realized my question, though relatively not important, was answered by a very influential man in the profession. An awesome relationship between archivists and the public was being created yesterday on social media and I was honored to see it happen. 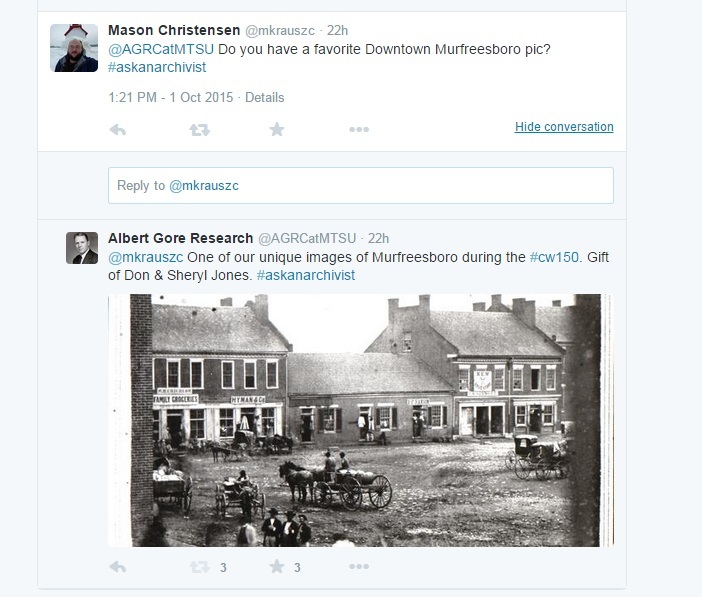 We even got into the action when a patron asked the Gore Center for pictures of downtown Murfreesboro. Though we don’t currently collect material on the downtown area, we shared with him one of our pictures from our Occupied Murfreesboro collection from the Civil War. Though we don’t know what sparked his interest in downtown Murfreesboro, being able to give him just one resource justifies the importance of our awesome little archive. We hope that more people take advantage of our wonderful collections spanning from important Tennessee political materials to records pertaining to MTSU and even equine studies in the Margaret Lindsley Warden Library. #AskAnArchivist day was a huge success but we do not want the interaction to end there. Getting people interested in their past is one way to keep the archives thriving and our history preserved. Here at the Gore Center, we want to answer any questions you might have about our collections or the archiving profession in general, not just yesterday but everyday! We even have awesome coloring pages developed by the Society of American Archivists that expand on the archive conversation by giving you resources and information across the bottom. So throughout this month, feel free to stop by and talk with us! Hi Alex. What a great experience for you.